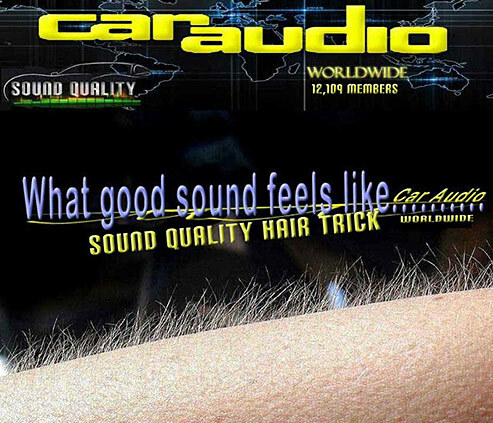 Leading member of Car Audio Facebook Group with over 12,000 members from over 40 countries. Studio musician and was on Billboard music charts with "Feel The Power" Image, "Holding On" Image and worked with Grammy Award-winning engineer Butch Jones. Master Installer Certification (MECP) with over 700 awards in competition including World Champion Car Audio in IASCA, USACI and WAC. First car audio competitor to achieve a perfect score together for RTA and SPL. 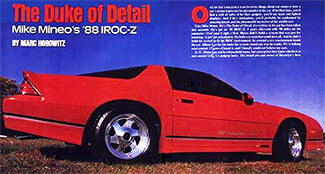 Appeared within such esteemed magazines as Stereo Review, Car Audio, Car Sound, Car Stereo Review, Home Audio, and Stereo Hi-Fi. Other special talents include deep knowledge of Controller Area Network (CAN) and Virtual Reality headpiece. Most of us have a long history with car audio starting at a young age. Beginning in the back seat of our parents car singing along to the songs on the radio to getting our driver's license and our first car. Remember the days of pulling up in front of our high school sweethearts house to pick her up and making sure the perfect song was playing on the radio. I would pass by my house without parking just for a few more minutes with the music blasting through the system. This was the beginning of me striving to push the envelope in car stereo. Soon, I had people lined up down the block wanting the same sound system within their car. So without further ado, here is the basics on building a car audio system that replicates what the studio engineer and musician originally intended the music to sound like. The car is a very different task in many ways as compared to setting up a system in your home or other venue. Because car dashboards as well as throughout the car are made out of plastic, this causes quite a bit of rattles, which create distortion in the music. Then you have all the mechanical parts inside of the doors, which also create distortion. There is limited real estate space to place the speaker drivers too. Furthermore, sounds also reflect off the glass and other hard surfaces within the car, which creates constructive and destructive waves. The first step in building a proper car audio system is to have a bench with all the equipment needed for your test. On my test bench you will find a Rahde & Shwartz signal source analyzer, Audio Precision AP audio analyzer, LinearX Audio & Acoustic Analyzer / Time Domain, Denon Blu-ray player, Fluke multimeter, Audio Control spectrum analyzer, soldering gun, a pair of fullrange speakers, two test tweeters, two test midranges, a midbass driver in a cabinet, a subwoofer in a cabinet, a test amplifier, a 12V power supply plus a plethora of hand tools. When starting your project, you first need to eliminate the rattles in the car. After the interior has been removed, we can now start the dampening process to remove the rattles. Rubber matting is put down on the entire interior using adhesive. When the matting is being put down it must be fitted and trimmed properly so the seats, carpet and all the plastics will slide back in correctly. Fiberglass, acrylic and Kevlar are used to reinforce the metal and plastic. Next, we must determine the resonance of the car. The resonance of the entire car is important because when we get to the point of installing our speakers the bass frequencies are normally where the resonance is and we do not want to exaggerate it more than it already is. There are numerous ways to determine the resonance, which I will explain in future articles. At this point it is time to calculate and design where the equipment is going to be placed. Keeping in mind to use as little wire as possible plus avoid the detrimental electrical signal noises by ensuring the power wires of the car and audio system are far away from the analog signal wires. In future articles I will get into this in more detail. When determining the placement of the speakers and equipment (using my test equipment), I look at the interior as a blank canvass. Do not let the factory placements sway one's opinions o where they should be properly placed within the vehicle. My personal preference is to usually leave the factory head unit. If not, I will use what is cosmetically pleasing and offers the features we are striving for. I now find the optimum path length between the speakers, taking into account available real estate using geometry, mathematics and my audio test equipment. Path lengths are crucial because of the distance between the speaker and listener. At this point, I take my test tweeters, midrange, mid bass plus bass drivers (which I am very familiar with) and put them within the car to study the acoustics of the car in its entirety. This gives me the ability to reach the maximum potential in understanding of the acoustical environment of the vehicle. This is to gain knowledge in ascertaining an idea of precisely where my equipment is going to be placed. I keep detailed notes of my data, so I can compare my test equipment against the equipment I am actually going to be using. Bear in mind, by doing these tests for so many years, I am now able to take some 'short cuts' as it were. Once all the data has been collected, I look for equipment that performs best within this particular environment. As a side note, some engineers and manufacturers build equipment that works in the majority of vehicles. Now it is time to start planning to cosmetically integrate my equipment with the acoustical data. I design all car audio sound systems around the acoustics of the vehicle. Here is where I add my personality, or the customer's personality, to the car. This is where you can really get creative as long as you continue to reference your data to make sure everything is acoustically correct. There are many aspects of fabrication including but not limited to, deciding upon the materials you are going to use. It is like a jigsaw puzzle. I prefer to use composites to fabricate such as Corian, fiberglass, acrylic, Kevlar etc. Now I build my bass box. My preference is 4th order bandpass. In some cases, I will integrate a 6th order into the 4th order box using an acoustical valve between the sealed portion, if it is determined I want to make it bass heavy at higher SPL levels. We need to take into account the fact that our ears hear from A-weighted or C-weighted depending on the volume when building my boxes. A drumset's floor tom-tom is one of the most difficult portions of music to reproduce within a car. If the bass is not linear, the floor tom-tom will not be replicated correctly. The bass boxes I build are usually located in the back of the car. There are a few exceptions when I make a decision to build bass and midbass together and place a woofer in the fender that reproduces frequencies from 20 Hz to 500 Hz. I use a pro driver when this design is used. It is piped in through the kick panel or dash board. I have found bass within a car needs to be at least 4 to 5 feet away from the listener to express itself correctly. When you do not have 4 to 5 feet of separation, such as a sports car, I put my sub enclosure under the front hood and choose to use a 4th order bandpass. This will give me a little more delay, providing the motor is in the back. Or I will put the woofer in the fenders if the motor is in the front as I mentioned above. Another option I use is reflecting the bass off a rear glass hatch window, such as in a corvette. Keep in mind that vehicles are a small enclosure, so your bass box is like a box inside a box. At no point will I ever choose to put woofers in the trunk, without being piped into the vehicle because this will introduce a lot of trunk rattles/distortion into the vehicle. Distortion is something that is not within the original audio source material but has been created by the vehicle's own environment. This is opposed to audio harmonics, which is a natural occurrence in the original source. In car audio we do not have the luxury of playing the entire bass range like Pro Audio does. So we break it down into two parts, which we call bass and midbass. I consider bass from 20 Hz to 100 Hz and midbass is from 100 Hz to wherever your midrange driver picks up depending on the midrange driver you are using. I put my midbass in the door, using materials to create an enclosure. In some cases I port it to get a flat frequency response. My reference to flat is at 90dB at the desired listening position. Of course I run other tests at different volumes to check for linearity, continuing to use 90dB as my reference. The issues with midbass are the rattles, distortion, and amplification beat-frequency oscillation. This must be addressed and corrected. The rattles and distortion should be fully addressed through careful calculation and thoroughly engineered fabrication. As far as the beat-frequency oscillation, I will address this at the amplifiers. I use flat because of my preferences for consistency and stability throughout the different volume ranges while I am running my tests. I prefer to put my midrange and tweeters within the dashboard. The reason I use dash placement is because there is no way to avoid reflections in a car, so I work with them. This is a very important aspect for soundstaging, imaging and achieving natural tones, which I call signature harmonics. It is very important that the drivers I use are identical out of the box. In my opinion they need to be absolutely no more than 1 dB off. Just because they come in the box together does not mean they are identical. My next step is processing. My personal preference is Pro Audio processing, because of my background as a studio musician. What I look for is very high signal to noise and low THD. Now we get to the amplifiers. The amplifiers purpose is to take a small electrical signal and increase it to thus make it 'louder' without changing the original tone, which is called linearity. A good example of a changed tone is a megaphone. It takes the voice and changes the tone and harmonic orders. Some amplifiers reproduce the original signal well and some do not. This must be determined beforehand. At every point between the crossover, processing and the amplification, I check for THD, signal to noise, channel separation and signature harmonics. I record a sound I am familiar with and run it through the system. I look at the amplifier for how much current it draws and the voltage the output it produces. Dynamic range, headroom and harmonics are extremely important. Amplifiers will make or break your system. It is also beneficial to use amplifiers that complement the way our ears work. Understand your listening habits such as the genre of music you listen to. I prefer using Class AB amplifiers because they do the best of both worlds, since my preference ranges through many genres of music. A person who typically listens to classical music may prefer a Class A amplification as opposed to a Class D topology. In this type of system I will use 8 to 9 channels of amplification. It can be beneficial to employ center channel support because some of the far field frequencies do not reach over to the other side. The far fields are normally 3 to 6 dB down, depending on on how far apart they are. Taking into account we are sitting off center within a car and I always design symmetrical systems. Thus using a center channel is there only to reinforce the far fields. I build little processors and custom devises for center channel support, as well as midbass support, plus build my own preamplifiers too. Note that a flat response is a measurement I use with test tones, chirps, pink noise and wobble frequencies as I am building the stereo. This is an ongoing learning process for everyone within this field of endeavor. Sounds is like two halves of a sphere you are putting together to make a complete continuous, and seamless circle. I also use Tesla theories, trigonometry and vortex mathematics. These types stereo systems create euphoria at the highest level. Many studies now show music can heal and it does connects us all. A big thank you to Enjoy the Music.com and I look forward to going into each one of these steps as well as the finishing touches and details in future articles.